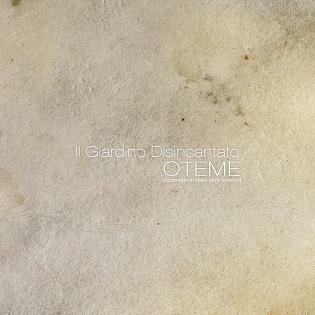 New Prog Releases: Oteme "Il Giardino Disincantato"
In between progressive, Rock in Opposition and contemporary music, finally the debut album of composer Stefano Giannotti. A 'variable geometry' ensemble, innovative and independent from commercial logic, searching for a metaphorical 'dry land'. Oteme is a chamber ensemble whose amplitude and texture vary depending on the songs and the language adopted: The Disenchanted Garden is a courageous and poliedrical experience which display different souls. From progressive art-rock to the achievements of classical and contemporary classical music, from songwriting to musical to the rigors of Rock In Opposition: unusual instruments (componium, teponatzli, the glass harmonica played by the authoritative Thomas Bloch), humor and surrealism from Battisti - Panella to Stravinsky, from King Crimson to John Cage. DP's PowerSquad "…from the GlassVoid"
Patrons of the Rotting Gate "The Rose Coil"
Cosmic Trip Machine "Golden Horus Name"
Sylvium "The Gift Of Anxiety"
Fish "A Feast of Consequences"
The Worm Ouroboros "Of Things That Never Were"
Distant Earth "Tears in Rain"
Kerygmatic Project "By Sheer Chance"
Ilvcia "In The Nature Of Reason"
Radio Massacre International "Clouds of Titan"
Ian Gordon "The Horror Show"
God Is An Astronaut "Origins"
Felix Martin "The Scenic Album"
Subrosa "More Constant Than the Gods"
Looking-Glass Lantern "A Tapestry of Tales"
AstroVoyager "ElectrOpera - Act 02 - Modulations"
The Luck of Eden Hall "Victoria Moon"
Besides "We Were So Wrong"
Simon Railton "This One's For You"
Pepe Maina "The Passing of Time"
Roy Harper "Man And Myth"
The John Irvine Band "Next Stop"
Claro de Luna "La Voz Quebrada"
Birds and Buildings "Multipurpose Trap"
Luna Achiary "More Human Than God"
Oceanborn "Hidden From The World"
Zevious "Passing Through The Wall"
Alyeus "Forty Days at Sea"
Soup "The Beauty Of Our Youth"
rEarth "For My Dreams I Fall"
Memento Waltz "Division by Zero"
Martin Barre "Away With Words"
Schnauser "Where Business Meets Fashion"
The Sun Through A Telescope "I Die Smiling"